The Team Leader/Supervisor Apprenticeship is suitable for anyone working in a first line management role, with operational/project responsibilities or someone who is responsible for managing a team to deliver a clearly defined outcome. As a manager they will provide direction, instructions and guidance to ensure all the set goals are met in a timely manner. 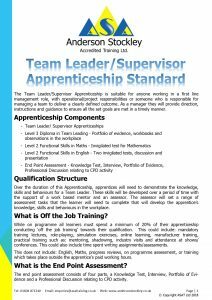 Over the duration of this Apprenticeship, apprentices will need to demonstrate the knowledge, skills and behaviours for a Team Leader. These skills will be developed over a period of time with the support of a work based mentor and an assessor. The assessor will set a range of assessment tasks that the learner will need to complete that will help to develop the apprentices knowledge, skills and behaviours in a customer service environment. While on programme all learners must spend a minimum of 20% of their apprenticeship conducting ‘off the job training’ towards their qualification. This could include; lectures, role-playing, simulation exercises, online learning, manufacturer training, practical training such as; mentoring, shadowing, industry visits and attendance at shows/conferences/competitions. This could also include time spent writing assignments/assessments. The end point assessment consists of 4 different parts, a Knowledge Test, Interview, Portfolio of Evidence and a Professional Discussion relating to CPD activity. The interview is designed to test the apprentice’s knowledge using a set of structured questions. This can be conducted over the phone, online, written, or via video link. The knowledge test is designed to assess the knowledge skills and behaviours of the apprentice. A series of different scenarios and situations will be used, with a series of questions requiring responses which will demonstrate the apprentices knowledge in that particular topic. The portfolio of evidence will be compromise of, written statements, reports, presentations, performance reviews between employer and apprentice, observations, ongoing professional discussions between apprentice and training provider relating to projects and assignments. As well as feedback from the line manager and peers. For the professional discussion apprentices will need to provide evidence of any additional learning/CPD undertaken during the apprenticeship, including any activity carried out during the course, including assignments or projects, details of any formal or informal learning, details of any professional discussions undertaken or support provided through professional bodies. The end point assessment consists of three different parts, the Apprentice Showcase, Observation and Professional Discussion. The Showcase enables apprentices to reflect and present examples of their development over the on-programme period. The showcase will be assessed either face to face or remotely. It can be showcased through a presentation of by a virtual form of assessment such as a report, storyboard or journal. The observation will be pre-planned and scheduled for when the apprentice will be in their normal place of work. The observation will give the apprentice the opportunity to evidence their skills, knowledge and behaviours. The discussion will be a structured discussion following the observation. This is to establish the apprentice’s understanding and application of knowledge, skills and behaviours. The discussion will last no longer than one hour. There are no specific entry requirements for this apprenticeship, however some employers may have their own entry requirements for applicants to meet. Furthermore all applicants will need to take an initial assessment for Maths, English and ICT prior to starting the apprenticeship.